Monthly data reported in the last week included a 5 month high in the Michigan consumer confidence index. 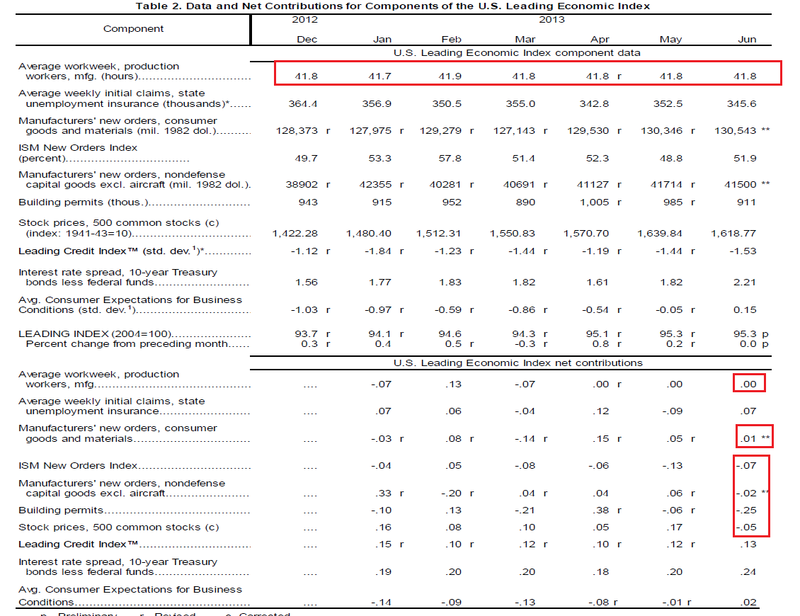 Almost all of this was due to the present conditions sub-index, while expectations for the future, a component of the LEI, gained only slightly. Durable goods were up, but only due to transportation. New home sales were up. Existing home sales were down. The price of Oil retreated from its 52 week high. The price of a gallon of gas should follow (and already is on GasBuddy). The 4 week average for gas usage was, for the third time in a long time, up YoY. Interest rates for corporate bonds had been falling since being just above 6% in January 2011, hitting a low of 4.46% in November 2012. Treasuries previously were at a 2.4% high in late 2011, falling to a low of 1.47% in July 2012, but remain back above that high, although they have backed off the recent new high. Spreads have varied between a high over 3.4% in June 2011 to a low of 2.73% in October 2012, and are very close to that low again. Refinancing applications have decreased sharply in the last 9 weeks due to higher interest rates to a two year low. Purchase applications have also declined from thier multiyear highs in April, and this week were again only slightly positive YoY. Housing prices bottomed at the end of November 2011 on Housing Tracker, and averaged an increase of +2.0% to +2.5% YoY during 2012. This weeks's YoY increase remained close to its 6 year record. The American Staffing Association did not report an update to their Index this week. Daily tax withholding has improved to the middle part of its YoY range compared with its YoY average comparison in the last 7 months. Initial claims remain within their recent range of between 325,000 to 375,000, and have flattened out just as they have in the last 3 springs and summers. Rail transport has been both positive and negative YoY in the last several months. This week it was negative once again. The Harpex index had been improving slowly from its January 1 low of 352, but has flattened out in the last 6 weeks. The Baltic Dry Index remained close to its 52 week high. In the larger picture, both the Baltic Dry Index and the Harpex declined sharply since the onset of the recession, and have been in a range near their bottom for about 2 years, but have stopped falling. Gallup's YoY comparison was extremely positive this week. The ICSC varied between +1.5% and +4.5% YoY in 2012, while Johnson Redbook was generally below +3%. The ICSC has recently been relatively weak, but Johnson Redbook remains close to the high end of its range. 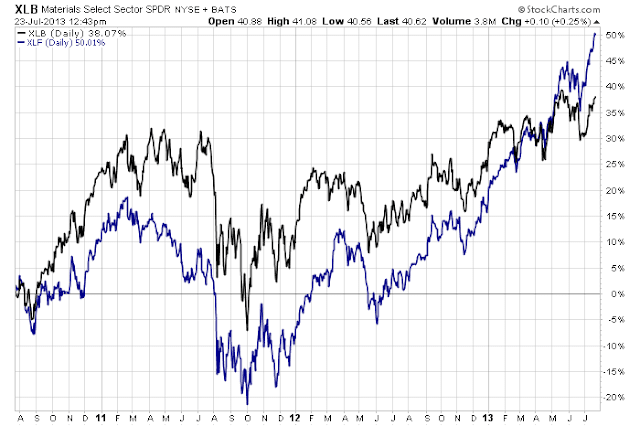 The TED spread is still near the low end of its 3 year range, although it has risen slightly in the last month. LIBOR has made another new 3 year low. This was a positive week, with the only outright negatives being mortgage applications, which are still declining, and energy prices, which are high enough to engage the Oil choke collar. 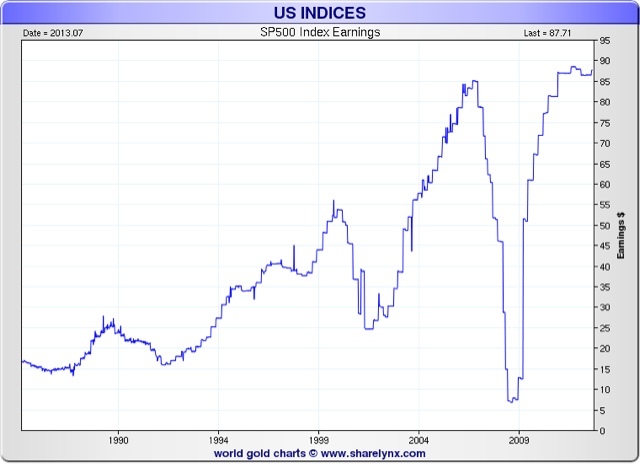 YoY S&P 500 earnings also remain slightly negative. Interest rates have subsided somewhat from their recent highs, and spreads are near 52 week lows. Other positives include bank rates, money supply, house prices, and commodities. Consumer spending is extremely positive as measured by Gallup, very positive as measured by Johnson Redbook, but only weakly positive as measured by the ICSC. Neutrals to slight positives include real estate loans, jobless claims, withholding taxes paid, and shipping rates. 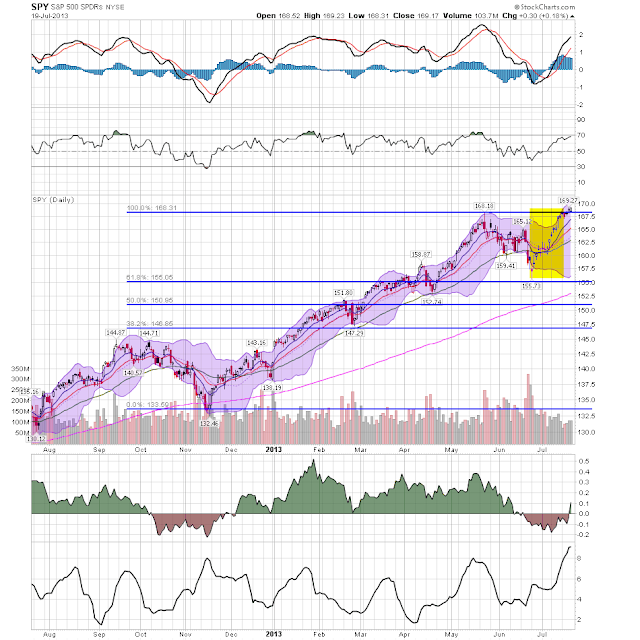 This week saw a respite in the recent negative turn in the long leading indicators of interest rates and mortgages, as well as a decline in the oil price spike. 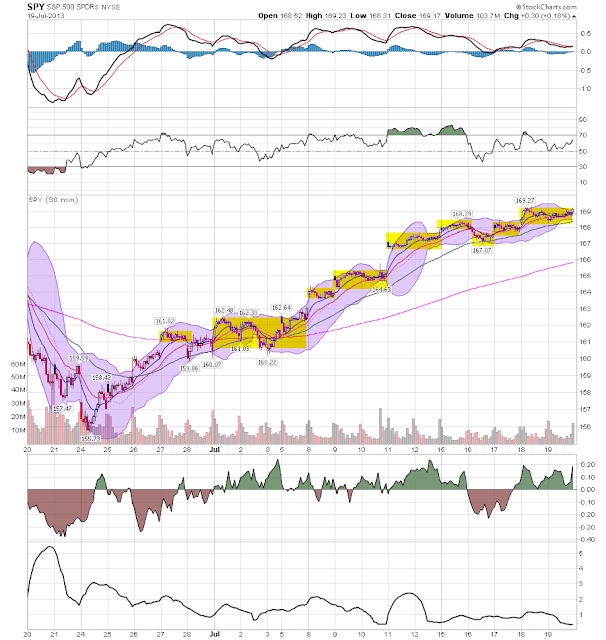 Short leading and coincident indicators remain positive. China's export led manufacturing drive has been a boon to natural resourc companies and countries that are natural resource exporters (Australia, Canada and South America). With China slowing, all of the countries will see a slowdown. Consider the commodity ETFs from this mornings report on deflation; with the exception of oil, all are moving lower. A stark shift in investor sentiment in global equity markets has accelerated this year with a widening gulf between the market value of big US banks and commodity companies in emerging markets. Five years ago, just ahead of the collapse of Lehman Brothers investment bank, the market capitalisation of US banks fell below the value of energy, materials and mining companies from the Bric countries – Brazil, Russia, India and China. The switch appeared to highlight a shift in global economic power and the rise of fast-growing economies beyond North America and western Europe. But now investor sentiment has flipped again. At the end of last week the market capitalisation of US banks – which exceed $1tn for the first time since November 2007 – was more than twice that of Bric energy and material companies, which were valued at $432bn, according to calculations by the Financial Times. Central to the economic growth model of the early 2000s was the South South trade: southern hemisphere countries with lots of raw materials to export sold massive quantities to China. Now that China is slowing, that trend is far smaller. The financial sector started to overtake basic materials at the beginning of the second quarter. How Much Damage Will Rising Rates Do To the Housing Recovery? Prices have fallen through the 113/114 price level which was providing short term support. 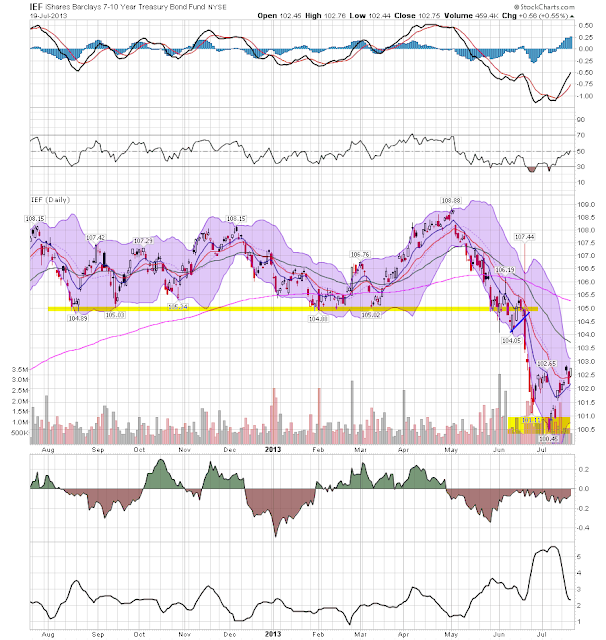 Now prices are in the 106-110 level and appear to be finding a short-term bottom. There's an uptick in momentum and a newly positive CMF implying at least a stabilization. In addition, consider the yield on the 10 year is now fluctuating around 2.5%, which isn't a bad rate of return in a low inflation environment. Put another way, I think we've seen the big bump up in rates that would be expected after the recent Fed announcement regarding tapering its bond buying program. At some point the combination of rising rates, higher oil prices, stagnant incomes and higher home prices may start to slow home sales. The Canadian economy has been hit over the last two quarters by slowing global demand. 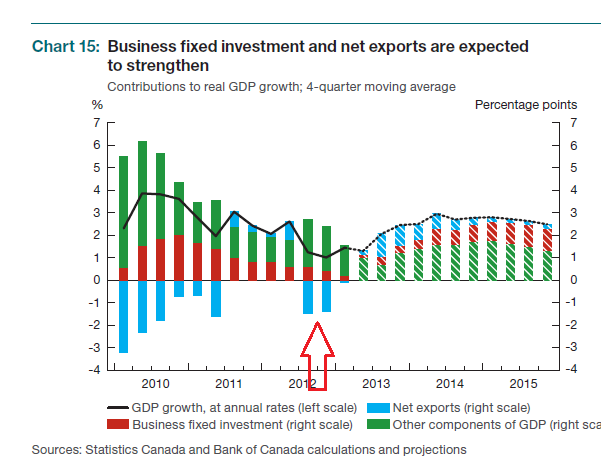 The blue part of each quarter's section represents net exports, which have decreased the last two quarters. 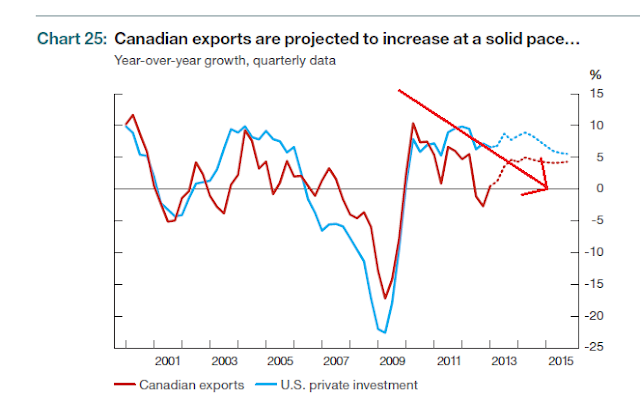 These drops in growth coincide with a drop in GDP to just over 1%. The export situation has been dropping for the last three years. Singapore’s exports in June extended the longest run of declines since the global financial crisis, suggesting economic growth last quarter may have been less than the government initially estimated. Non-oil domestic exports slid 8.8 percent from a year earlier, falling for a fifth month, the trade promotion agency said in a statement today. The median of 17 estimates in a Bloomberg News survey was for a 5.8 percent drop. As I've noted before, a big reason for this slowdown is a slowing global economy; the EU is in a depression and China is re-balancing its economy. June export orders declined 3.5 per cent year on year, weighed down by weak demand from Asia and Europe. Sales to China alone dropped 1.9 per cent, while sales to the broader Asian region fell 3.8 per cent. The 10.4 per cent drop in orders from Europe accelerated the 0.4 per cent contraction seen in May. The global economy is growing more slowly than expected, with risks to that growth increasing especially in emerging markets, says the IMF in an update to its World Economic Outlook (WEO). Global growth is now projected at 3.1 for 2013 and 3.8 percent for 2014, a downward revision of ¼ percentage point each year compared with the forecasts in the April 2013 WEO. Global growth increased only slightly in the first quarter of 2013, instead of accelerating further as expected at the time of the April 2013 WEO. The underperformance was due to continuing growth disappointments in major emerging market economies, a deeper recession in the euro area, and a slower U.S. expansion than expected. 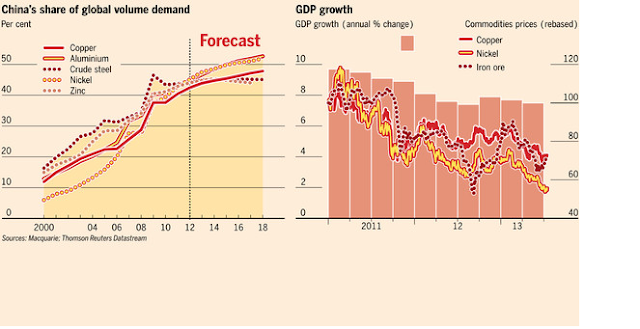 By contrast, growth was stronger than expected in Japan. Looking ahead, the IMF expects the brakes behind the recent underperformance to ease, but only gradually. Growth in the United States is forecast to rise to rise from 1¾ percent in 2013 to 2¾ percent in 2014, as fiscal consolidation slows and private demand remains solid. In Japan, growth in 2013 is now expected to be 2 percent, up ½ percent from the last WEO, reflecting the boost to confidence and private demand from recent accommodative policies. The euro area is forecast to remain in recession in 2013 before growing again in 2014. Activity in the region continues to suffer from the combined effects of low demand, depressed confidence, financial market fragmentation, weak balance sheets, and fiscal consolidation. Growth in emerging market and developing economies is expected to moderate to 5 percent in 2013 and about 5½ percent in 2014, some ¼ percentage point lower than projected in the April 2013 WEO. The weaker prospects reflect, to varying degrees, infrastructure bottlenecks and other capacity constraints, lower export growth, lower commodity prices, financial stability concerns, and, in some cases, weaker monetary policy support. In China, growth will average 7¾ percent in 2013–14, ¼ and ½ percentage point lower in 2013 and 2014, respectively, than in the April 2013 forecast. Recently, several developments have affected inflation adversely. Surging unprocessed food prices, rising oil prices, and the increased exchange rate volatility may continue to have adverse impact on inflation in the short term. Although the Committee sees these developments as temporary to a large extent, a measured monetary tightening is deemed necessary in order to contain a deterioration in the pricing behavior. In order to support the price and financial stability, the Committee has decided to raise the upper bound of the interest rate corridor. Cautious stance will be maintained until the inflation outlook is in line with the medium term targets. In this respect, additional monetary tightening will be implemented when necessary. Due to ongoing uncertainties regarding the global economy and the volatility in capital flows, the Committee has decided to increase the flexibility of the liquidity management. To this end, developments regarding price stability and financial stability will be closely monitored and necessary adjustments will be made in the composition of Turkish lira liquidity provided by the Central Bank. After moderating last fall and this spring, year over year rate of change in both the PPI and CPI has jumped in its most recent reading. Increasing rates makes it more attractive to hold deposits and financial resources in Turkey, thereby increasing (hopefully) the stability of the country. 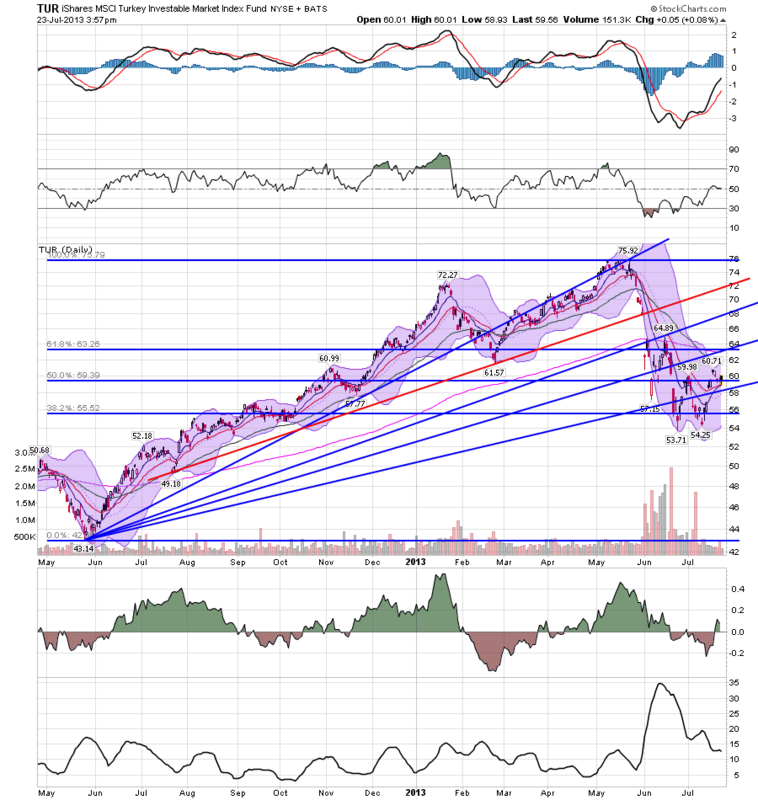 The Turkish ETF broke its upward trend (the red line), falling from 75.92 to 53.71 for a drop of about 30%. Since then, prices have been fluctuating between the 38.2% and 61.8% Fib level, while also getting resistance from the 200 day EMA. 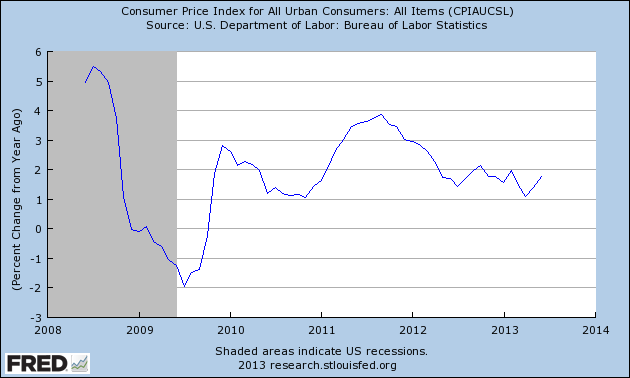 Meanwhile, consumer price inflation has been running below the Committee's longer-run objective of 2 percent. 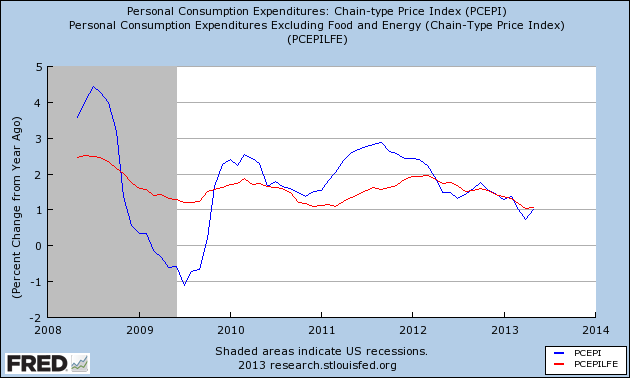 The price index for personal consumption expenditures rose only 1 percent over the year ending in May. This softness reflects in part some factors that are likely to be transitory. Moreover, measures of longer-term inflation expectations have generally remained stable, which should help move inflation back up toward 2 percent. However, the Committee is certainly aware that very low inflation poses risks to economic performance--for example, by raising the real cost of capital investment--and increases the risk of outright deflation. Consequently, we will monitor this situation closely as well, and we will act as needed to ensure that inflation moves back toward our 2 percent objective over time. Over the last few months, the hyper-inflation calls of many have gone by the wayside as more and more evidence emerges that deflation may be the real potential problem we are facing. 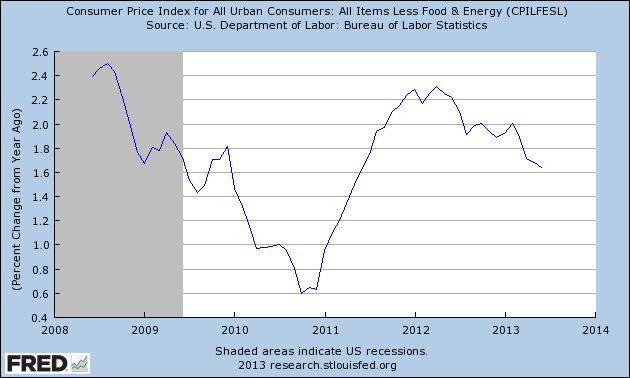 Total CPI has been running below 2% for most of the last year. Both the year over year percentage change in PCE and core PCE expenditures have been decreasing since mid-2011 (total) and early 2012 (core). Perhaps most importantly, gold (which I use as a proxy for inflation expectations among traders) has dropped from very high level. And where would potential inflation come from? Overall demand is low. The US unemployment rate is still over 7% leading to low wage growth. This prevents demand pull inflation from occurring. Capacity utilization is at 77.8%, indicating factories have plenty of ability to ramp up current production to absorb increased demand. Internationally, China is slowing and shifting to an economic model more focused on domestic demand. That means the upward pressure on commodity prices doesn't exist in the same rate. The EU is still in a depression, lowering demand from the second largest economic block in the world; the developing world is slowing in tandem with China. Most of the agricultural complex has been dropping since 2012. 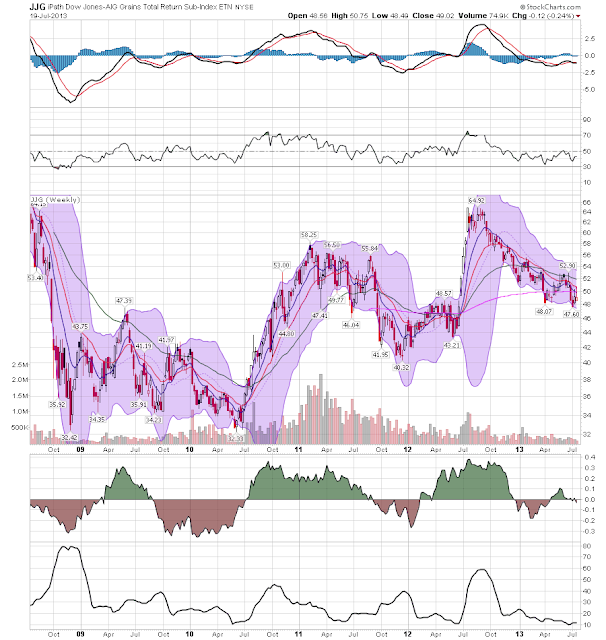 Grains (top chart) have been dropping since mid-2012 and softs (bottom chart) have been dropping since early 2011. 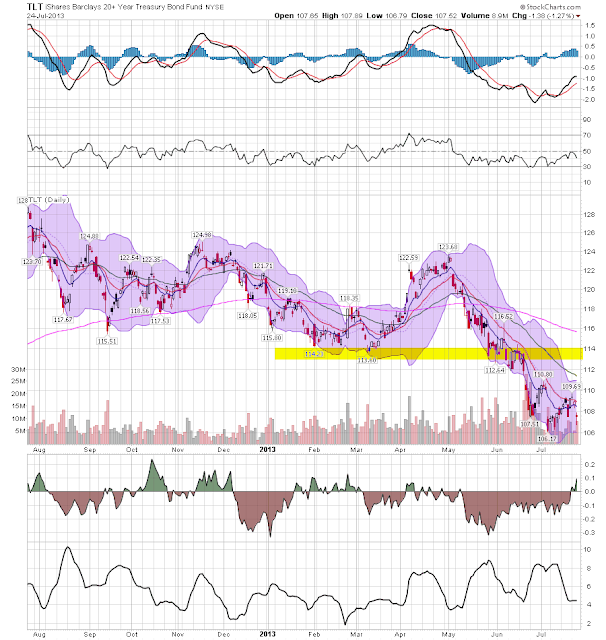 Copper is at important technical levels on the low side. Oil is the one commodity that runs counter to this thesis. However, it's recent rise has occurred in the summer (and therefore in the "summer driving season) and was originally caused by the political situation in Egypt. More importantly, as oil's price increase the oil choke collar tightens around the US economy, slowing growth and therefore inflationary pressure. 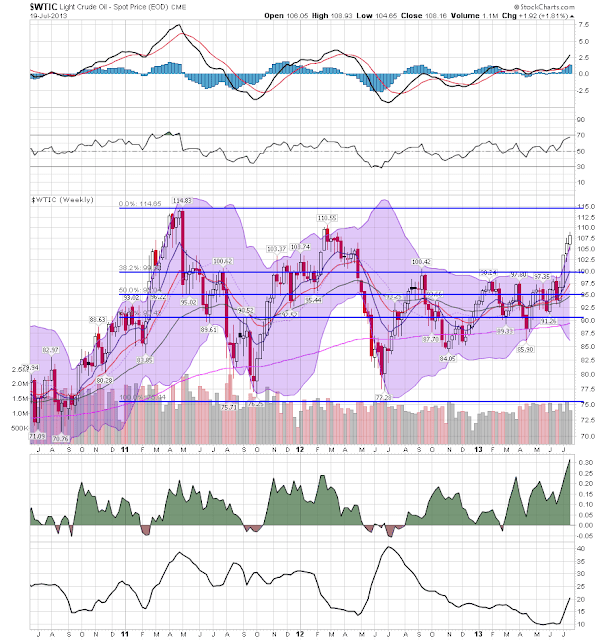 Commodity prices are declining, save for oil. And oil's price increase will eventually slow growth decreasing inflationary pressure. Unemployment is still too high to lead to meaningful wage increases and capacity utilization can still increase to absorb price pressures. In this environment, inflation just isn't a major problem. In view of the recent interest rate spike, now is a good time to review the status of the long leading indicators, which typcially forecast the economy more than 12 months in advance. Last month I wrote that a 1% spike in interest rates was necessary but not sufficient to signal recession. At the time I considered adding housing permits, but I didn't. 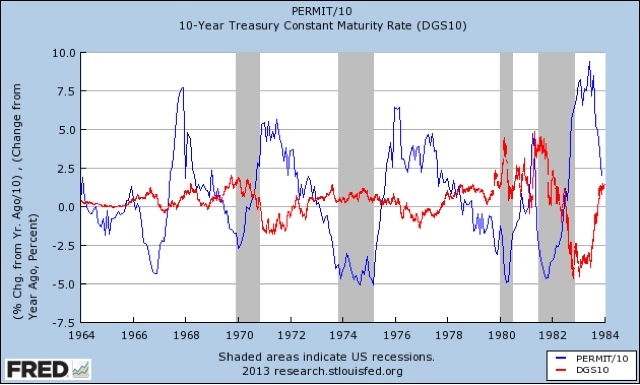 For a good reason: housing permits don't add much information to the signal given by interest rates. OK, they're squiggles. But the important point is they are esssentially mirror images of one another. 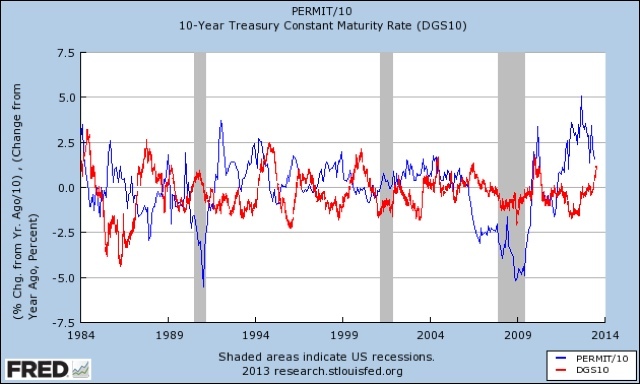 When interest rates go up 1% or more, YoY housing permits go down and even turn negative. Literally the only exception to this pattern was 2006-09 when the housing bust presaged the deflationary great recession, so interest rates went down as well. But notice that there are a number of occasions (9 to be exact) when interest rates increased, and housing permits decreased, but no recession occurred: 1966, 1968, 1972, 1978, 1984, 1987, 1994, 1996, and 2004. Put another way, the sudden softness in housing permits and starts in June may have been a surprise in their quickness, but are an expected result of the interest rate increase and don't give us a lot more information about the economy. OK, even more squiggles. But here's what you need to know: when we add in corporate profits as an indicator, all but two of the false positives for recession drop out, leaving only 1966 and 1984. In both cases, by the way, the economy came close to going into recession, but didn't. 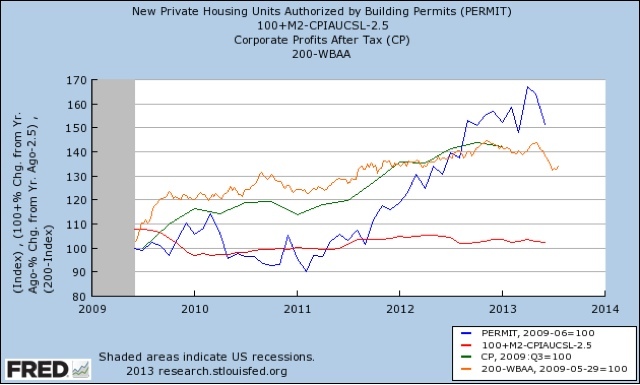 Look to the most recent readings: while interest rates are up over 1% YoY, housing permits haven't quite yet turned negative YoY, and corporate profits after taxes are still slightly positive. 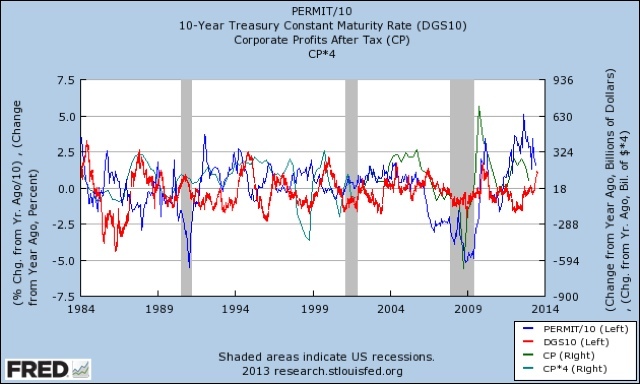 Note that we actually had a small but actual downturn in 3 of the 4 long leading indicators (permits, corporate profits, and real M2) in parts of 2010 and in early 2011. Doubtless this was one of the things leading to ECRI's blown recession call almost two years ago. As of now, we don't have even that synchronized downturn. To summarize: interest rates have risen sufficiently to cross a warning threshhold, but housing permits are still positive YoY (although I strongly suspect they'll turn negative within a few months if interest rates remain at their recent elevations). 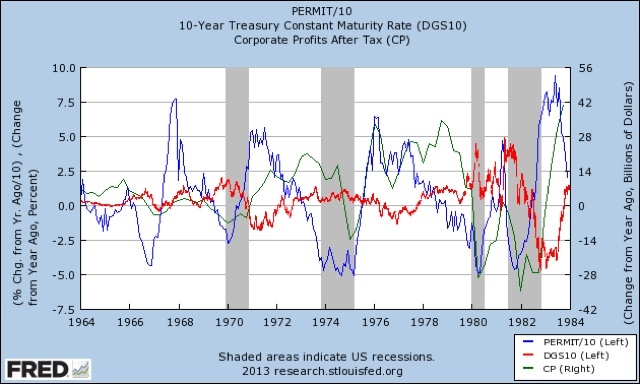 Corporate profits are also on the verge of crossing a negative threshold, but aren't there quite yet. 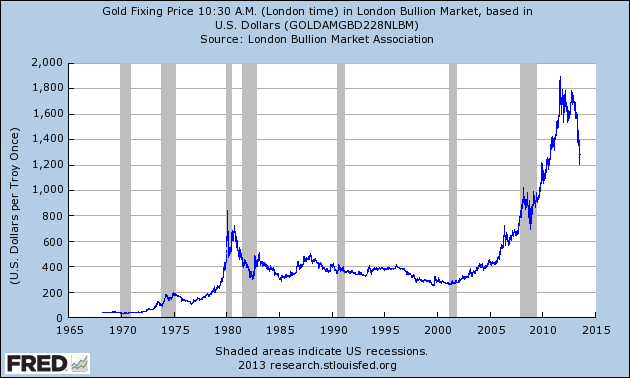 Real money supply is still significantly positive. 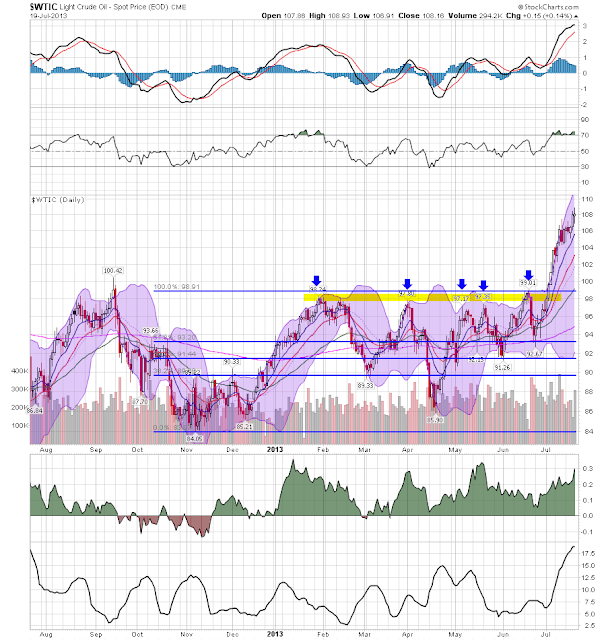 Oil Still At Higher Levels; How Long Until The Oil Choke Collar Slows the Economy? The weekly chart really shows the new key levels. The 110 and 114 price level are now key resistance ares for the market. Oil is the only commodity market that is showing any meaningful price appreciation right now. 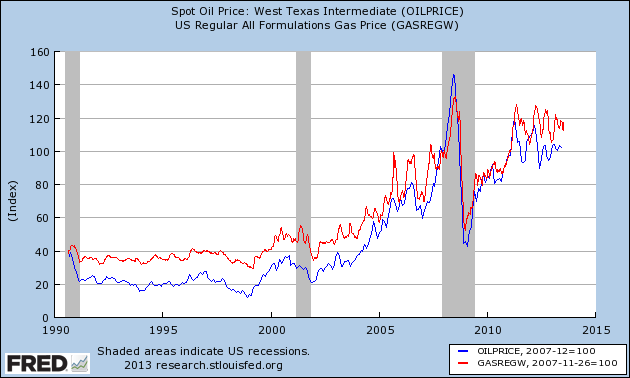 In case you were wondering, here's a chart of the relationship between oil prices and gas prices. I've reduced both to a scale 100 to show the very tight relationship. 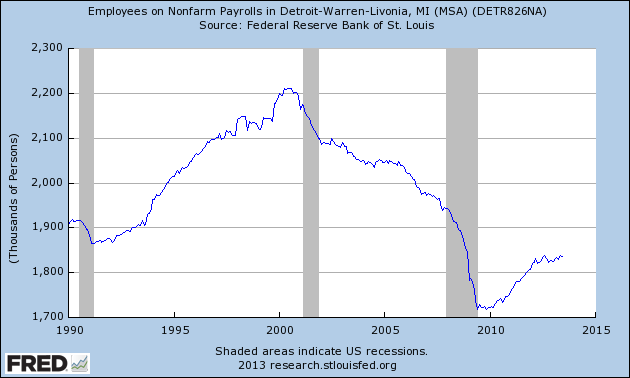 Last week's Detroit bankruptcy got me thinking about what the economy for that city looks like. Thankfully, the FRED data system has some very interesting data points to consider. 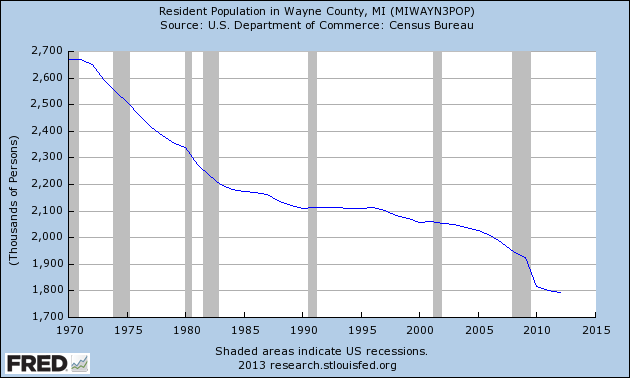 This is the one I found most interesting: the resident population of Wayne County where Detroit is located. Since 1970 the region has seen a steady decline. We see the first big drop occurring in the 1970s as the population dropped from a little under 2.7 million to about 2.25 million. There is slight attrition in the 1980s and 1990s where we see a decrease of about 300,000 (about 2.2 million to 1.9 million). It's really the last 10 years that show the sharpest decline, as the total population fell from about 1.950 million to 1.8 million. Many retirees expressed a feeling of powerlessness, a sense that they stand to lose the benefits they worked a lifetime for because of things beyond their control. Motor City has lost more than a million residents over the last six decades. When it shrank its work force, it left fewer current workers to contribute to pension funds that still had to pay benefits that were earned by large numbers of older retirees who had served Detroit when it was a bigger city. I also found this really interesting. The unemployment rate was low during the 1990s. 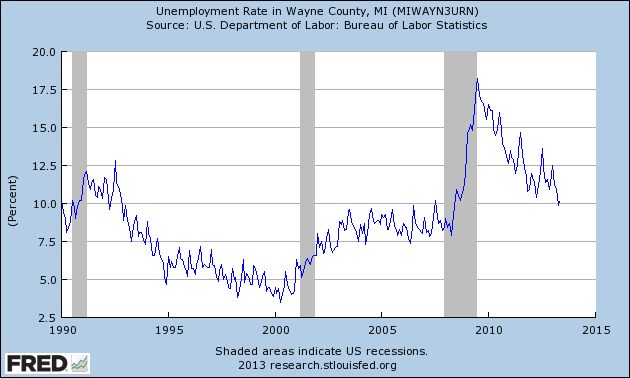 However, during the first expansion of the 2000s unemployment was still high, fluctuating between 7.5% and 10%. We see a huge jump to 17.5% at the height of the last recession. 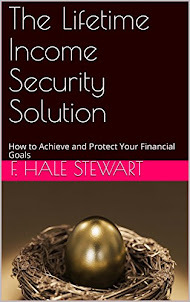 Now the rate is 10% -- which is about 2.5% higher than the national average. Notice the drop in non-farm payrolls that occurred in the previous expansion: we see a drop from about 2.1 million to 1.7 million. 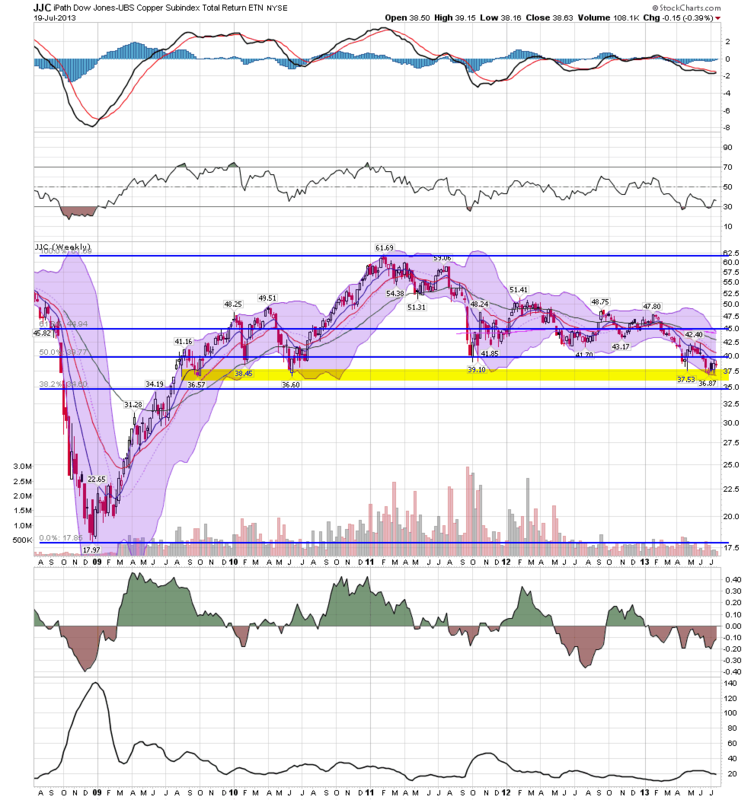 Now we see a rebound to about half of the previous level. Just as importantly, that pace of creation as been flat for about the last year. 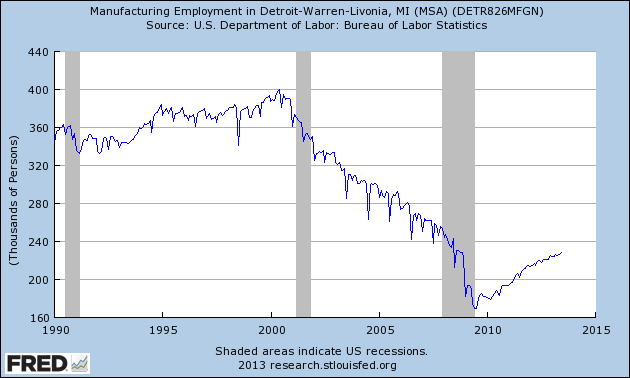 During the early 2000s when the economy was expanding, Detroit lost over 150,000 manufacturing jobs. That's a mammoth number. And the rebound has been tiny compared to the fall. As a result of the huge population outflow and drop in overall jobs, we see a major drop in housing starts. 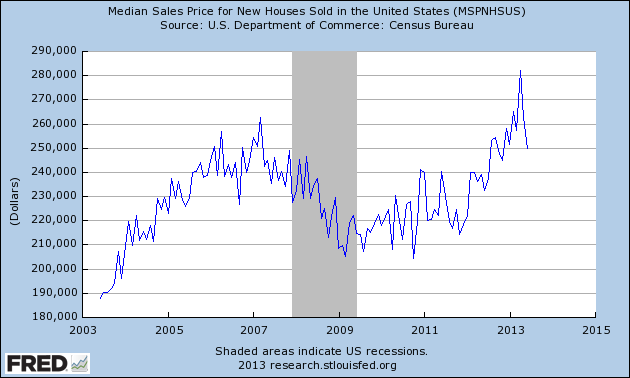 Remember -- housing starts are a big component of most economic expansions, meaning this drop is very important. These charts only tell part of the story. But they are still fascinating to consider. The overall picture is of an economy growing at a slow but steady pace. Hardly news around here, but a good summation nonetheless. Let's take a look at some of the individual pieces of information. There were several releases on manufacturing that were positive. Overall industrial production increased .3%. This was a welcome development as the last two monthly readings have been disappointing. Additionally, the Empire State Manufacturing Survey increased to 9.5 -- not a barn burning level, but a slight increase from the previous month. The reports internals were far more encouraging with new orders and overall production increasing. The Philly Fed index increased to 19.8, which was the highest reading since March 2011. sub-indexes also showed noticeable improvement. Retail sales -- while increasing .4% in nominal terms -- decreased slightly overall. More importantly, outside of increases in car purchases, other purchases decreased: Receipts at restaurants and bars decreased 1.2 percent in June, the most since February 2008. Sales dropped 2.2 percent at building materials outlets, the most since May 2012. Purchases at department stores fell 1 percent in June, a fifth consecutive decline. Four of the indicators were negative -- ISM and manufacturers new orders, stock prices and building permits. Manufacturers new orders for consumer goods were just barely positive while the average workweek of production workers was 0. Also note in the top graph, worker's hours have been treading water for the last 7 months. The just is still out on why we saw this drop. But I don't think the interest rate issue can be ignored. Conclusion: the news this week had some important problems. The 0 reading on the LEIs is pretty concerning, as these numbers have a very good predictive history. 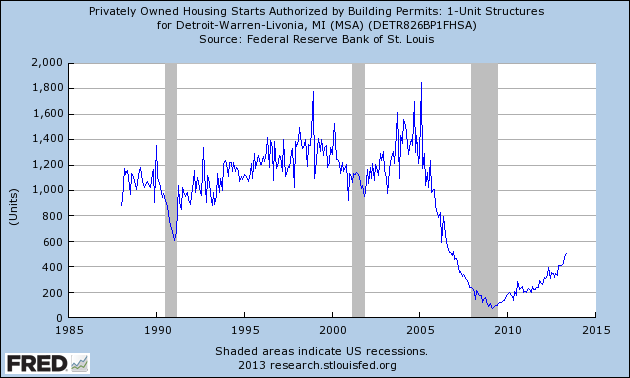 The drop in housing starts and permits is also potentially problematic. Yes, it is one month worth of data which means we shouldn't read too much into it. But it's also occurring during a period of rising rates and slowing retail sales which is concerning and bears further watching. As I pointed out last week, the recent rally is composed of inter-day moves (see bottom daily chart)but very little intra-day movement (see the top 30-minute chart). Part of the reason for this is the timing; in the summer most traders take vacations, so trading desks aren't nearly as active. 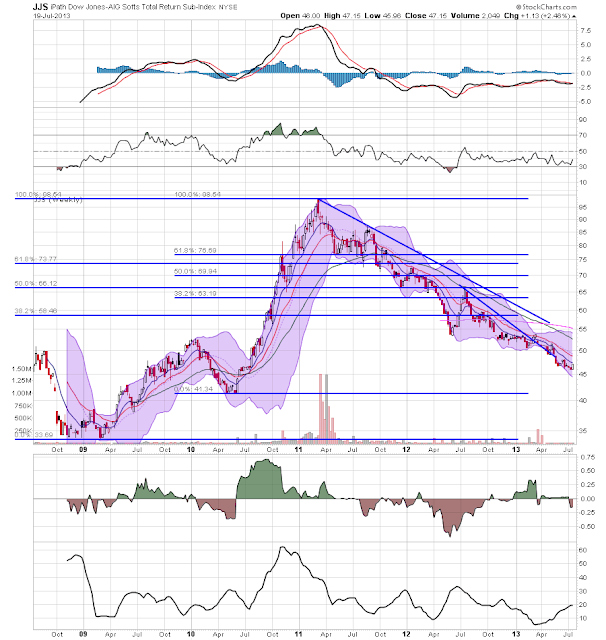 The lower volume readings on the lower chart show this in more detail. Some $19.7bn was invested in global equity funds in the past week, the most for six months, while $700m was pulled from bond funds, according to figures from EPFR, which tracks mutual funds and exchange traded fund flows. The $17.5bn flowing into US equity funds was the most since June 2008. Around $6.5bn of this went into State Street Global Advisors’ popular “Spider” ETF, which tracks the S&P 500 index. It appears the treasury market has found a bottom and is consolidating losses in the 100.5-102.5 range. On the daily chart (lower chart) we see a rising MACD (even though it's still in negative territory) and a rising 10 day EMA. 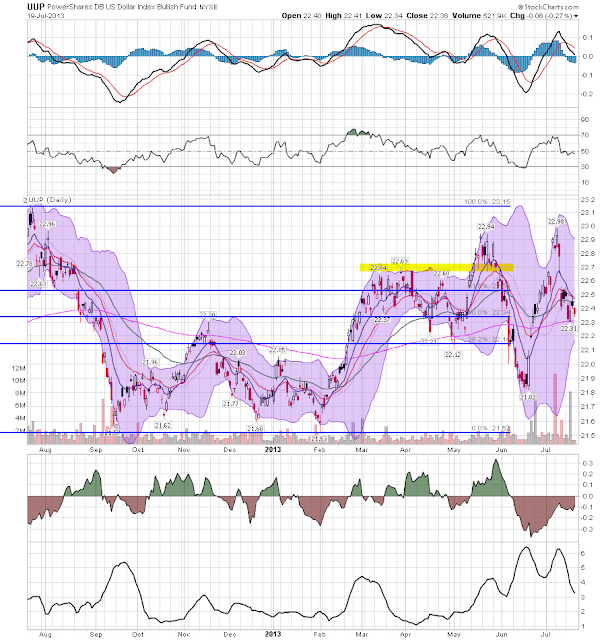 The 30 minute chart (top chart) shows that after bottoming in the around 101, prices rallied to the 102.65 level. Then we see a second drop to 101.5 only to rally again to the current 102.5 area. As I point out last week, it appears that the 2.5% yield handle is an attractive yield for foreign central banks. The dollar ETF found support at the 200 day EMA this week. But it's still in an overall range.